Angel Wing Begonia is a decorative, flowering plant. It has large, angel wing-shaped, dark green leaves, often with metallic silver specks. The underside of the leaf is usually a deep red. The Angelwing begonia blooms during summer. These flowers are a small waxy type that grows in groups from the stems, and kind of droop or hangs. The flowers commonly bloom bright red to light pink in color. It grows well in bright indirect sunlight originating from the south, east or west window. It also thrives under fluorescent lights. Avoid direct sun which can scorch the leaves. It prefers an average room temperature of 65 – 75 degrees Fahrenheit / 18 – 24 degrees Celsius. Angel Wing Begonia is not cold- tolerant and can be harmed by temperatures below 50 degrees Fahrenheit / 13 degrees Celsius. 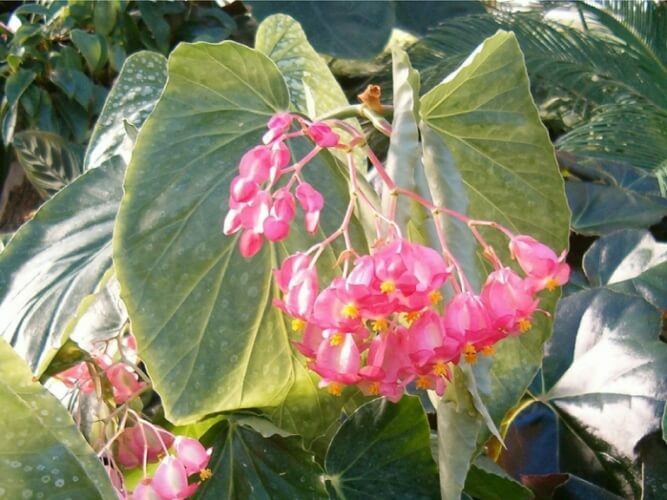 Begonia is rhizomatous, growing from a thick, fleshy rhizome that grows just below the surface of the soil. Re-pot in spring when the rhizome outgrows the pot. Because rhizomes have shallow roots, a shallow pot will do. It can be easily propagated by stem cuttings or leaf cuttings. Take three inches to stem cuttings with leaves in early summer and root them in a moist, sterile potting blend. Cover with plastic or a glass cloche to raise humidity around it until new leaves form. Begonia has no serious pest or disease problems. Begonia is susceptible to attacks from spider mites, mealy bugs, and aphids.